In hole-card games of blackjack (American variants), the dealer receives one face-up card and one face-down card (the hole card), before players play out their hands. If you have enjoyed this format of the game, no doubt at some point you have wished you could peak at the dealer’s hole card, so you’d be able to make a more informed decision. Well, Double Exposure allows you to do just that. Double Exposure is a variant of 21 available to play for real AUD money at several of our endorsed online casinos. You won’t be able to find this version of blackjack anywhere in Australian brick and mortar casinos, however. In the game, both dealer cards are exposed, and while there are other rule alterations which favour the house, this format of blackjack still ranks as one of the best blackjack variants, in terms of player odds and low house edge. Enjoy high quality and professional gaming at these online casinos. Guts and G’day are both instant play gambling sites, where no downloads are required to play blackjack and other real money casino games. Casino-Mate, Royal Vegas and 7 Sultans give players the option to either install the full casino suite package on their computers or play instantly via their Web browsers. The main rule change in Double Exposure is that both dealer cards are revealed prior to the player making any decisions. This rule by itself significantly reduces the house edge, and in many scenarios, informs the player if he or she must hit in order to beat the dealer – knowledge a player would never have in any other form of blackjack. In terms of probabilities, games where the dealer stands on soft 17s are better for the player, as opposed to variations where the dealers hits on soft 17s. Net Entertainment’s Double Exposure game forces the dealer to stand, and also pays out on player blackjacks, regardless of what the dealer has, so we do recommend Net Ent’s variation over Microgaming’s Double Exposure. The theoretical return to player for Net Ent’s Double Exposure is 99.33 per cent (equivalent to a house edge of 0.67 per cent), which is a very low house edge for blackjack games. In the following picture, it is clear the player must hit on his/her hand of 16, in order to attempt to better the dealer’s hand of 18, which the dealer is forced to stand on. 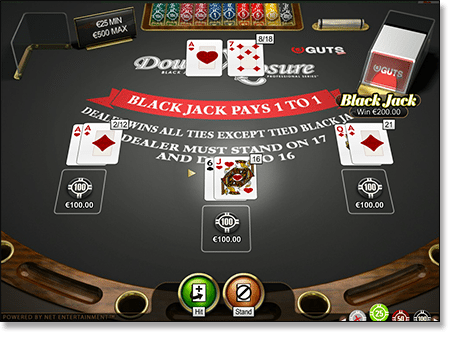 Strategy in this game differs significantly from basic blackjack strategy because in many scenarios, a player is forced to hit on hands he or she would always stand on in traditional games of blackjack. For example, if the dealer is showing 20 and the player has 18, he or she must hit (and hit a Three card) in order to win. Hands like these become tough to win, however overall, the game is far friendlier to the player than in other variants of 21. Sign up at www.GdayCasino.com or www.Guts.com and enjoy the perks of playing this enjoyable and player-beneficial version of blackjack. Deposit AUD currency and be rewarded with a free welcome cash bonus.